Responding effectively to the potential impacts of a changing climate requires shifting individual and community energy behavior, and a scientifically informed populace prepared to address climate-related issues on a community and policy level. This level of behavior change is a non-trivial educational and societal problem, comprising a constellation of variables from scientific content knowledge to sociocultural value and belief systems, self-identifications, existing infrastructure and economic barriers and opportunities. To date, many efforts to encourage climate and energy-related behavioral change focus on a micro-scale (individual) or macro-scale (government, community) plane. In this study, we report on a pilot study of a curriculum designed to support energy behavioral change at the meso-scale (family) in an alternative school with a high percentage of students who identify as members of groups traditionally underrepresented in science. We examine the potential for positioning students as agents of change in their families, and explore how students and their families initially change and sustain actions related to climate change in the home during and after a pilot implementation of the Green Ninja Smart Energy Tracker curriculum. We examine what motivated or constrained participation in energy conservation behaviors for students and their families, as well as student engagement in climate change and energy conservation action. They tend to guard and cling to the paradigms, values, and institutions that have proved to be successful in their own past based on coping with decadal fluctuations in climate change or multigenerational social perturbations. As a result they are reluctant to undertake corrective actions that go against their social grain (p. 41). Responding to change on a large scale is thus slow, as people and societies gather experiences that demonstrate that previous modes of existence are no longer beneficial in new climate regimes. As climate changes happen on the order of lifetimes, changing to adapt to these changes go against generations of accumulated climate knowledge and systems. However, without adaption, societal systems will no longer achieve the success they once had. “The system will either fail (collapse) if people are incapable of overcoming the negative impact of climate change,” writes Hassan, “or undergo remedial actions if people do not or cannot act in time through effective coping mechanisms” (p. 45). To date, however, societal responses have been slow and the survival of established societal systems remain threatened. Crate and Nutall (2009) describe climate change as ultimately an issue of culture, as “the ability of humans to adapt and respond to climate change impacts is likely to be community-specific and inequitable” (p. 9). A National Academies of Sciences (2008) report on responding to climate change addresses the inequity inherent in climate change impacts, as those who are most impacted by climate are also those who will have the most difficulty adapting to the pace and magnitude of change. Addressing this inequity requires supporting human ingenuity that allows all communities to make adjustments that maintain community and cultural sustainability (Hassan, 2009). A culturally responsive approach that leverages the values and lived experiences of learners is advocated in order to support multiple dimensions of science learning including increased conceptual understandings, understandings of scientific epistemologies and increasing agency in evaluating and making decisions about responding to climate changes (Walsh & Tsurusaki, 2014). These pedagogies aim to ameliorate inequities that currently discourage inclusion of all individuals in scientifically informed decision-making around climate changes by building bridges between dominant scientific and social communities with underrepresented communities. Addressing adaptation and equity in a culturally responsive manner necessitates consideration of the place in which students live and in which climate science education and action occur. Recent work has demonstrated the dynamic manner in which youth move across social spaces, and the importance of considering mobility across place and context in analyzing learning (Leander, Phillips & Taylor, 2010). In their analysis of youth narrative of place, Tzou, Scalone & Bell (2010) argue that environmental educators should take a social justice perspective that explores how places are constructed by students because place is an “inseparable part of social narrative” (p. 106). In this work, we attend to the contexts in which students live and to they ways in which these places and the meaning these places have for students inform the climate actions students can and do take. Specifically, we explore the efficacy of bridging home and school contexts via the Green Ninja Energy Tracker curriculum. The energy tracker surfaces home behaviors in the classroom through the use of online energy data, and challenges students to change behaviors and observe the impact on home energy use and costs, encouraging discussion of energy in the home. While many climate communication and education efforts have centered on transmission of particular content, studies have indicated that conceptual understandings are less important for behavioral decision-making than social values and group membership (Kahan et al., 2011). Research has further demonstrated the importance of framing messages to adhere to particular social values and interests (Grajal & Goldman, 2012; Nisbet, 2009; Wibeck, 2013). An ongoing concern has been grappling with feelings of despair or becoming overwhelmed when engaging with this topic, and energy and climate educators and communicators have explored how to frame this issue in a way that highlights the potential negative consequences while also supporting hope and agency (Moser, 2007). This research highlights the duality of emotional appeals, which can either spur or demotivate audiences. Patchen (2006) argues that individuals are more likely to actively desire to participate in climate change mitigation if they see actions bringing net benefits to themselves, society or the environment, or if they have been emotionally aroused. Researchers and practitioners have studied the efficacy of various affective framings, including drawing on the valuing of animals or faith-based environmental stewardship (e.g. Grajal & Goldman, 2012; Leiserowitz et al., 2015). However, to date, the complex intertwining of affective motivation, and behavior changes for groups particularly from underrepresented communities is not well described. To support students’ learning pathways, the Framework and the NGSS advocate for a perspective of science learning as knowledge in practice, that “situates knowledge in authentic scientific practices” (NRC, 2012). This perspective includes having students actively participate in and reflect on practices and processes that lead to the creation and communication of new knowledge (NRC 2007, 2009). These practices include analyzing and interpreting data, engaging in argument from evidence, obtaining, evaluating, and communicating information and constructing scientific explanations. The Energy Tracker curriculum highlights the data analysis and interpretation practice described by the Framework and located in the NGSS. This analysis practice is contextualized in a relevant socio-scientific problem (climate change) and made personally consequential by situating the problem in youth’s home experiences. Analytic practice has previously been used to support climate change learning. Rule and Meyer (2009) found that youth (12th grade) had an enhanced conceptual understanding of climate change when lessons included graphical analysis. Lessons that focused on graphical analysis led to gains in graph reading tasks, improved performance on a conceptual survey, more enthusiasm for future work, and more interest in pursuing further learning on the topic. In Maine, teachers and students used a high-resolution energy tracking website similar to the one in the study to understand and decrease school energy use (Kermish-Allen, Peterman, MacDonald, Thompson & Winner, 2015). Researchers found that this experience had positive outcomes in conceptual understandings, awareness and behaviors. Here, we employ a similar analytical tracking experience but add an additional layer of personal consequence by using student home data. In this study, we examine how students and families measure and reduce household energy use while learning energy and climate science concepts. 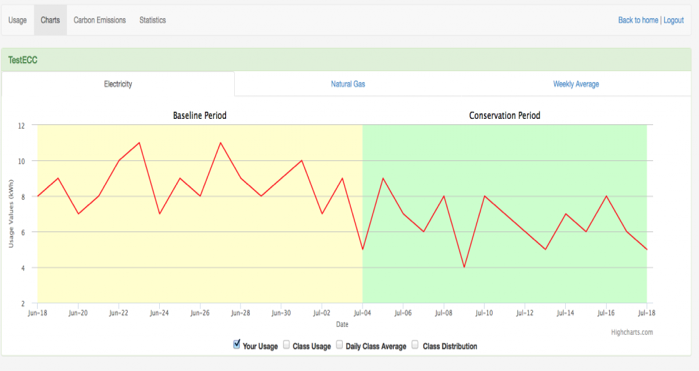 Students used an online energy tracking tool that leverages Pacific Gas and Electric (PG & E) Smart Meter technology to record their daily household energy over a period of time (Fig 1). We use a mixed-methods approach to investigate attitudes toward, perceptions of and reported behavioral changes through classroom observations, surveys and focus groups, specifically: 1. What kinds of practices related to energy do families participate in in the home and how are these practices informed by various kinds of knowledge, values, structures and community memberships? 2. In what ways can a data-based energy conservation design challenge curriculum support energy conservation behaviors and what are the challenges and opportunities for using this curriculum to connect home energy practice and school science? 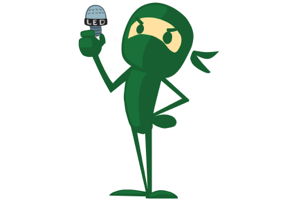 The Green Ninja (greenninja.org) is a superhero designed to inspire youth to take action on climate change. Through humorous films and associated media products, Green Ninja develops tools that help students take steps towards a more sustainable world. The Green Ninja Energy Tracker is one such tool, and this study draws on data from the first pilot of the Energy Tracker Curriculum. The Energy Tracker Curriculum allows students to actively learn about climate change and possible mitigation by participating in a four-week curriculum centered on energy and climate change, that includes testing the energy use of various appliances, and culminates in monitoring and adjusting their own energy behaviors. 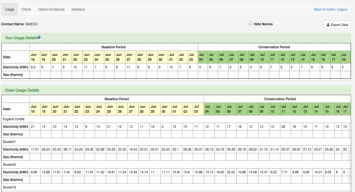 Using the Green Ninja Energy Tracker interface (Fig 1), students are able to test the effect of shifting energy behaviors and see the results. Students use the Green Ninja Energy Tracker by inputting their home’s energy data into online software that allows them to track their real time energy use. Students in this pilot primarily used data from PG&E’s Smart Meters. Students first take a monthly reading going about their families usual energy use practices to get a baseline energy use and then the second month try to use energy reduction methods to lower their energy use by as much as possible. After the completion of this curriculum students compare their data and analyze successful energy use practices. Figure 1. A screenshot of the Green Ninja Smart Meter Energy Tracker interface. 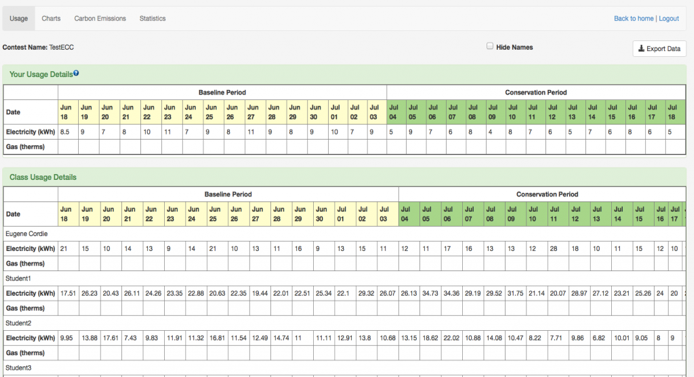 Students’ enter data in the top panel, and graphs are displayed below for the baseline and conservation periods. The pilot implementation was conducted in a senior level earth science course at Chavez High School (a pseudonym), an alternative high school in a middle class neighborhood in the California Bay Area. The class consisted of roughly fifteen students; students demographics were approx. 50% Hispanic, 21% Asian, and 29% Caucasian. Data was collected between December 2014 and February 2015. We use a mixed-methods approach to analyze the impact of a pilot curriculum that utilized Smart Meter Energy Tracker software in an Earth Science classroom in an alternative school. Data includes student surveys (23 total surveys), classroom video and audio recordings (~24 hours), video/audio recordings of a focus group at the conclusion of a climate change unit (~60 minutes), and curricular artifacts (including student Energy Tracker data). Video and audio recording of classroom implementation allows for analysis of classroom dynamics. The unit took roughly two months, and classes were held twice a week. Cameras were placed on opposite sides of the classroom to give us full coverage of the classroom and students. We also placed audio recorders on the desks of the participants to capture student conversations. During classroom observations we also, at the request of the teacher, helped supplement the curriculum by aiding in the facilitation of lessons, allowing us to further interact with the students. One week following the conclusion of the pilot implementation, we conducted a focus group with the students to evaluate the outcome of the study and what the students took away for the Energy Tracker curriculum. This study was conducted on a Friday during the student’s lunch period. We asked a mix of predetermined and emergent questions relevant to student’s engagement with the curriculum and the topic of climate. Pre- and post- surveys targeted student knowledge and attitudes towards climate change. This survey included general questions about climate change such as, “Greenhouse gases, including CO2, come from the burning of fossil fuels like coal and oil” and “I do not believe global warming is an important problem.” The students then selected from five likert-scale responses: strongly agree, somewhat agree, not sure, somewhat disagree, and disagree. The statistical power of these survey is low, however, due both to the small sample size of students (N = 14). In addition, there was turnover in the class with some students leaving and entering the classroom at the winter break. Because of this, survey results are not analyzed statistically, but are instead used to inform and triangulate the qualitative classroom and focus group data. The focus group video was transcribed first. We extracted student discourse from the Focus Group that expressed the student’s views on climate change and the curricula. Using the surveys as informative, we emergently coded the focus group transcript and relevant portions of the video data for themes, to develop assertions (Erickson, 1986). One key aim of this pilot was to explore the elements of the energy tracker curriculum that were productive in engaging youth in the topic and action. Classroom observations of students and student responses in the focus group indicated a high level of engagement in the assignment and the topic. This was evidenced by their attention to and completion of the assignment and their interest in pursuing learning of the topic and energy behavior changes in the future. Notably, all students in the course completed the energy tracker assignment, both identifying and carrying out energy conservation behaviors in the home and conducting the graphical analysis of their energy usage. In the focus group, students reported that they enjoyed the experience and most stated that they would continue the energy conservation behaviors they had established in the home. In the focus group, it emerged that the most engaging aspect of this curriculum for the students was being able to see an immediate connection between their energy usage and cost savings. Student Don explained in the focus group that this immediacy was the most interesting part of the curriculum: “For me it was just being able to track it. Being able to see your actual progress.” Another student, Emilio, also reported that he liked using the Energy Tracker because he was able to track the connection between his actions and saving money: “I was able to tell how much energy I use, and I was able to compare if I made a difference or not.” Being able to see the progress was important for these students because it gave them motivation to change their practices or continue doing what they were doing. It also provided an ability to engage in friendly competition with their classmates, and this encouraged them to try to be the person with the highest reduction. The teacher also encouraged this competition by rewarding extra credit points to whoever reduced their energy the most. This led to students asking each other how much they were saving throughout the conservation period of the curriculum. Students reported that they were more willing to cut energy consumption when they saw how much money they would save, than they had been previously for environmental reasons. One student was able to cut his families energy consumption by 38%, and when asked if he was continuing the practices that cut this consumption he said he was because he was saving his family money that they could use elsewhere. When asked in the focus group whether or not they were interested in learning more about climate change on a scale of 1 (not interested) to 5 (very interested), student Mike selected a 3. He explained that his selection was because he was only interested in learning more about climate change as it related specifically to saving him and his family money: “ I chose 3 because the only thing I want to learn is ways to save more energy at home and spend less money on electricity.” The other students in the group agreed with him that this was the main reason this topic would be of ongoing interest to them. The Energy Tracker facilitated home-school connections in two main ways: it surfaced youth home practice in the classroom, and facilitated sharing of classroom learning with families. This provided insight both into what youth home practices were, but also what influenced whether or not energy saving behaviors were adopted. In some cases, students reported that changes in energy behavior were tied to important health and safety concerns. For example, student Mike had the largest decrease in his energy bill and discussed how he had instituted some conservation behaviors in his home despite his grandparents’ safety concerns. In the focus group, Mike explains how he saved money, and the connection between his money-save practice and his grandparents’ perceptions of safety. Int: Oh, now you’re turning them off? Int: Does it make them feel less safe? Mike: No I just tell them to stay in the room and lock the door ((students laugh)). Mike reveals that in his house the kitchen lights are always left on because his grandparents believe that this will deter burglaries. Prior to the beginning of the energy tracker, then, these safety concerns were a higher priority than the possible energy or economic benefits of turning the light off. However, Mike discussed what he learned in class with his grandparents and the decision was made to stop leaving the light on. Mike claims that this hasn’t had a negative effect on his grandparent’s perceptions of safety, and somewhat flippantly remarks the he just tells them to lock the door. Mike’s story not only surfaces the kinds of energy behaviors that can and were changed through the curriculum, but also some of the structures that inform why energy behaviors exist in the first place—in this case, safety was a paramount concern. Scott: I don’t remember who told me but someone told me to wrap my windows in saran wrap so my dad and I did it for one night and the heating bill was a lot less. Int: Wow, so saran wrap around the windows. Is it still up there? Int: Would you put them back up? This is an example not only of school-home connections, but also of the importance of being able to quickly receive a benefit for a behavioral change, and to be able to make a clear link between the energy conservation behavior and the change. Here, Scott and his father engage in the energy conservation behavior of wrapping windows and they noted that this made a significant decrease in their energy bill. Being able to connect the decrease in the bill with the behavior encouraged Scott to continue with this behavior, as he says he will fix the damage to the wrap in order to keep saving energy. Students also used what they were doing in class to their advantage in their home, to their own reported benefit. In class, one student claimed that he liked conserving energy because his sister wasn’t allowed to take as long showers in the morning. This student said he used this to his advantage in the morning before school because it gave him more time in the bathroom. This is one example of how students discussed being motivated to act if they see a positive benefit to them in their home life. Throughout both the class and the focus group, it became clear that the students felt a clear distinction between their own personal agency in carrying out energy conservation behaviors, and their agency in affecting societal change. Despite this disconnect, students had ideas about how this gap between personal and societal agency could be bridged. Students demonstrated that they felt a significant amount of personal agency and capability of changing their own energy behaviors and reaping the benefits of those behaviors, including the economic advantages discussed earlier. Students were able to identify ways to save energy and put these into practice using the Energy Tracker. They reported adopting many energy behaviors in the focus group, and connecting these behaviors to decreases in energy use and cost. For example, one student said: “We changed the light bulbs to the LED ones and that saves us a little bit of money” and another reported that: “I turn off the heater at night, yeah. It used a lot of energy.” The students also identified productive habits they had begun to engage in that wouldn’t have shown up on the Energy Tracker, such as drinking tap water instead of bottled water contributes and reducing the time they spend driving. However, while the students generally did feel that climate change was a serious issue and that they were able to take personal actions, they felt unsure about their abilities to offset the negative impacts. When asked if climate change was a serious issue, 6 out of 8 focus group participants claimed that they agreed. The two students who did not agree viewed climate as a more distant threat; one stated “We’ll be dead by the time anything bad happens,” downplaying the threat posed by climate change. Although the students generally agreed that something needed to be done about climate change, they were fairly pessimistic about their ability to help be a part of a solution. For example, one student said, “We can’t do anything unless everyone does and that isn’t going to happen”. Students did not believe that other people generally cared about climate change and thought that would inhibit action on the topic. Here, Jeff and Cara discuss how challenging taking collective, societal action on climate change will be. Jeff first states that he doesn’t think most people will take action unless they see negative impacts, and Cara adds that action requires “everyone” to do something, which isn’t going to happen. Jeff continues that he thinks education is important (“spreading the word”) but that even if people are motivated and see negative impacts, if they don’t have social support, that is, if “there’s still a bunch of people who don’t care” the action ultimately won’t be sustainable, and people will “give up.” Most students in the focus group indicated that they agreed with Jeff’s assessment. Don: It’s hard because everyone is use to using so much energy and they don’t want to stop. Jeff: That’s the way our society is now. We got the new iPhone and iPads, all this, and we need the energy to charge it. In this excerpt, Don makes the point that everyone is using energy and doesn’t want to give that up. Jeff adds that this is how society is structured, and that there is a value on high energy-consuming devices. The students generally felt that these were signficant and perhaps insurmountable obstacles to stopping climate change. Despite their stated pessimism, however, students were enthusiastic about learning more, solving the issue, and had several ideas that could potentially help support societal movement. The first idea that surfaced was to create some kind of climate change action group that would brainstorm ideas on potential solutions, and then grow this group as the word about the organization got out. When informed that there were such groups out there, the students were asked if they would be interested in joining this type of group, and all students said they would be. The next idea was to create more laws and regulations aimed at reducing carbon emissions and enforcing these new laws. The students felt like the government needed to have a bigger role in curbing climate change and encourage individuals to reduce their energy consumption by incentives like tax write offs for individuals that reduced their energy use. They also stated that there needed to be more strict enforcement of the laws that are currently on the books. They then discussed how climate change education should begin at a younger age. The reason they believed they should do this is because they said first time they ever heard of climate change, and the dangers that it poses, was in their senior science class. Finally, the students thought it would be a good idea to offer a class in high school about energy and climate change. They said this because they know there is a lot more to learn about the topic and that it would help spread the word of climate change and encourage more people to take action. They all agreed and said they would be interested in taking such a class if it was offered at their high school. Thus, although they initially reported feeling like societal action was improbable, they demonstrated a willingness to try to grow their own personal action into a more systemic solution. The proliferation of sensors and real-time data has opened up substantial opportunities for students to use real, meaningful data in the classroom. Previously, educators and researchers have capitalized on this opportunity by providing students with the opportunity to use real-time or near-real time school energy data or scientific time series (e.g. Kermish-Allen, Peterman, MacDonald, Thompson, & Winner, 2015). Climate change educators use tools like Carbon Footprint calculators to connect students’ actions, behaviors and experiences to climate science and action (e.g. Cordero, 2008). The Energy Tracker studied here combines these two approaches by allowing students to examine personally consequential time-series data, and experiment with reducing their own energy use and home energy bill. The immediacy of the energy-tracker software was motivating for students, as they could see the impacts of their actions quickly. This addresses one major stumbling block for climate action, that of delayed versus immediate gratification (Moser, 2010). That is, most actions on climate problems do not have visible, immediate or obvious results to reinforce the action. With the Energy Tracker, students and families are able to experience immediate gratification, even though it is economic not environmental gratification. This combination of personal connection and real-time tracking was engaging for students, in part because they enjoyed engaging in friendly competition with each other. Previously, researchers have shown that this kind of social interaction through comparative feedback has led to changes in energy use practices because of competition, social comparison, or social pressure (Abrahamese et al, 2005). The importance of these social dimensions of energy behavior change becomes even more clear when one considers that feeling socially isolated (one of the few that care about climate change in a sea of less-concerned others) was the main issue students identified as blocking effective climate action. The results of this study align with previous work that highlights the resonance between energy action and economic benefit. This relationship between behavior and economic incentive is not new—Winett, Kagel, Battalio & Winkler’s 1978 study examined a group of homeowners who reduced their electrical consumption by 7.6%-12% when provided with a financial incentive (Winett, Kagel, Battalio, and Winkler, 1978). It is unsurprising that individuals are more willing to act on climate change if they see monetary benefits rather than seeing mitigation practices as losing something (i.e. heating, driving, etc.). A question then arises as to whether behavior changes will persist if or when the incentive is removed. The students in this study claimed they would continue their new practices, but long-term changes in behaviors are notoriously difficult to achieve (Abrahamese et. al, 2005). More work would be needed to understand what supports, if any, are needed to sustain the practices students began in this curriculum. While some values, such as economics, have been well-documented to shape behavioral changes, there are a myriad of other social, contextual factors that can inform if, how and to what extent individuals participate in energy conservation behaviors. Many of these factors are likely integral in determining whether behavior change is fleeting or sustained. Environmental stewardship and economics are two of the most common values that have been implicated as potentially helpful in supporting behavioral change, in addition to increasing awareness and knowledge (Wibeck, 2012). However, there is still a significant amount that we do not know about what constrains energy practices in the home. While we have general understandings of values and priorities, it is unclear how these values inform decision-making processes in the home particularly for underrepresented groups. To address this issue, it is useful to take use a critical lens in conjunction with traditional place-based education methods as a starting point to interrogate the structures that shape learners’ participation in spaces (Grunewald, 2003). This is especially necessary as students from lower income communities or ethnic minority backgrounds live in areas with the highest potential for negative climate and other environmental impacts (cf. Bullard, 1990; Faber & King, 2002; NAS, 2008). To effect shifts in communities, we must understand how places in which learners live are constructed to support particular constrained modes of participation. If we hope to make progress in shifting behaviors, it is necessary to better examine the constellation of social realities that are in play in a decision-making moment. For some communities who have diminished resource availability, energy conservation behaviors may be at odds with existing or perceived constraints. For example, in cases where there is a significant safety threat, families like Scott’s are justified in choosing a less-energy efficient practice that could, in this case, deter burglaries. However, in other cases, the priorities might be reconsidered, as was the case for Scott and his grandparents. In any decision-making process there is a trade-off between needs. Energy is used to light streets as a crime and accident deterrent, and this is seen as a reasonable use of energy given the context; asking cities to remove their streetlights would not be seen as a reasonable or sustainable energy behavior change. Likewise, it is important to surface and respect the competing concerns that happen on a family or individual decision-making scale and make sure that the energy conservation behaviors that are encouraged do not cause harm. 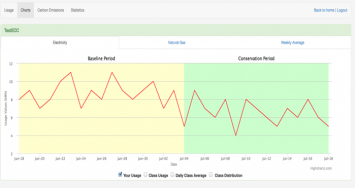 Having students use artifacts like the Energy Tracker to discuss their home energy usage in the classroom can help to reveal the array of factors that are a part of energy decisions. This allows students to discuss energy habits with their peers, their teachers and their families, and both learn from and educate their families about climate change and energy. This pilot work has merely scratched the surface at understanding how families construct understandings of place and the implications of that for taking actions on climate change. In future iterations of the Energy Tracker, we plan to look in greater depth at the specifics of family’s energy conservation behavior changes and their decision-making processes, in order to shed light on this dimension of climate action and education. Despite the positive changes made, students still felt that their energy conservation behaviors might not have very much impact. This mirrors survey results showing a decrease in American’s perceptions of the potential for energy-conservation actions by individuals in industrialized countries to reduce global warming (Leiserowitz, Maibach, Roser-Renouf, Feinberg, & Howe, 2013). One of the factors informing students’ engagement with and enthusiasm for participating in energy conservation behaviors was their perception of the willingness of others to also engage in these behaviors. For this group of students it was important not only to be aware of the issue, but also to be aware that others cared about the issue. Students were interested in increasing community involvement, and had ideas about engaging others through community groups. By belonging to such a group, or even being aware that other community groups existed would have increased the students’ perceived societal agency. While membership in groups has previously been tied to behavior change (Kahan et al, 2011), this study suggests that having an awareness of belonging to a larger social group is also important for sustaining behavior changes. Using a tool like the Energy Tracker in conjunction with a larger community might help decrease the sense of isolation and increase students’ perceptions of their agency to effect societal change. This pilot implementation suggests that data tracking and analysis is one method that has potential to build bridges between scientific, home and school realms to bolster student and family participation in energy conservation behaviors. We found that by participating in this curriculum, students successfully identified effective energy conservation practices, and applied this to their everyday individual and family energy decision-making. Future work should continue to explore the complex ecosystem of variables that constrains and informs home decision-making practice, and also explore the potential of energy use analysis for other dimensions of science learning and engagement.